The weighting section allows data to have an influence on other data on the basis of mathematical curves. Through this section, users can assign a curve to each value included in a specific field of the table. In order to weight maps, firstly check the “Weighting on” box. “Listeners data” : this role can be assigned to one map for each project. This map has the function of defining the land subdivision. For this purposes, it can be used a grid, a census map, a zoning map or whatever land classification map. Type field is the field of the table which contains the family name of the values to be weighted (i.e. Transport network). Sub-Type field is the field which contains the sub-type of the values to be weighted. To each subtype, users can assign a different curve (i.e. Public Transport, Bykelanes, Highways,..). By default, mathematical curves have been previously set to linear functions. 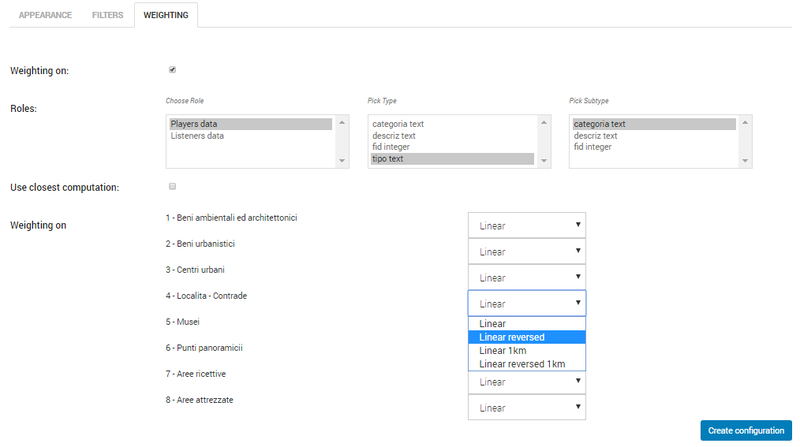 Clicking on the dropdown menu, users can choose between the curve types associated to the project.